This is a very personal story. It's the story of how William joined our family and became our son. William is 21 years old now, has been working and attending Nova Scotia Community College and will be heading to university in September. A variation on this story has been published in the no-longer-existent alternative Catholic weekly, Catholic New Times. It has also been published in the German magazine Spotlight. It was written just before William's third Christmas. He was born November 29 so he spent quite a lot of his first Christmas as a precious gift under our tree. This is the story much as I wrote it then. I made a couple of very small insignificant changes and I added photos. I hope you enjoy reading it. I'll give you this much background: When my husband Dan and I met and married, we were both past the age where we expected to become parents. But we knew we loved and admired and respected each other, we had common life goals and cared about the same things, and we knew – as much as anyone can know such things – that, with our work and our home and our friends, we'd be a happy fulfilled family of two (plus three personable, sometimes neurotic, cats). 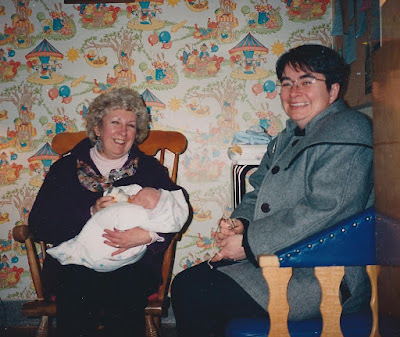 All that notwithstanding, one day we decided that we would take the Children's Aid Society's eight-week course called Orientation to Adoption. We felt pretty sure that we would never be able to adopt a child through an agency but we thought we would learn something and we might as well be prepared just in case something came up. We went dutifully to our classes, listened to social workers and others involved in the world of adoption, and joined an adoptive parents' organization. We looked briefly into international adoption, read material about other alternatives, but never really turned adoption into a project that took over our lives – as we saw happen in some other families. Whenever we mentioned our wish to raise a child, we seemed to get the same advice: tell everyone you know; tell friends and relatives, teachers and nurses, doctors and dentists. Eventually, the advice said, someone would know about a child available for adoption. Adopting a baby has become difficult almost everywhere for reasons that most people are familiar with: more effective methods of birth control; an increasing tendency for single mothers to keep their babies; and greater access to legal abortion. So maybe it's not surprising that the first question we often get is, "how long did you have to wait?" It's not an easy question to answer: it was 1990 when we took our CAS course, so perhaps we waited four years. But it was late October 1994 – about a month before our baby was born – when we got a telephone call from a doctor/friend who said, "I have a patient who will be giving up her baby for adoption. Are you still interested?" We thought it over for about five minutes before we said, well, of course we are. Within a couple of days, we went to meet the mother of our baby. Together with the doctor, we had breakfast together and talked about our lives. She had two other children and a job that enabled her to raise them comfortably; she felt that a new baby would be an addition to her life that would upset a balance she'd been able to construct. We told her about our jobs, our house, our neighbourhood and some of the values we held that we thought would be relevant to child-rearing. In fact, our values – the importance of equality for all, of alleviating poverty, of eliminating discrimination and racism – extended into our work: I was (and am) a writer and broadcaster working mainly for alternative media but I was also a regular TV and radio political panellist. Our baby's mother had seen me on TV and felt she knew something about me already. 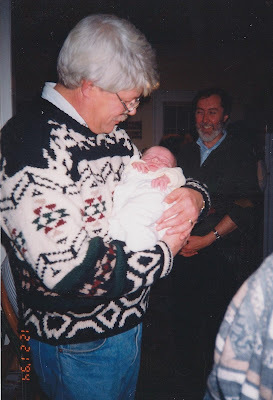 Dan is a longtime senior worker with the NDP and was much respected – as was his party – in Nova Scotia politics. Two days after our meeting, the doctor/friend called and said, "She likes you. She wants you to adopt her baby." There was a little confusion about the due date but it was thought that the baby would be born in about a month. So did we wait four years? Or did we wait – with some trepidation and superstition – for about 30 days? 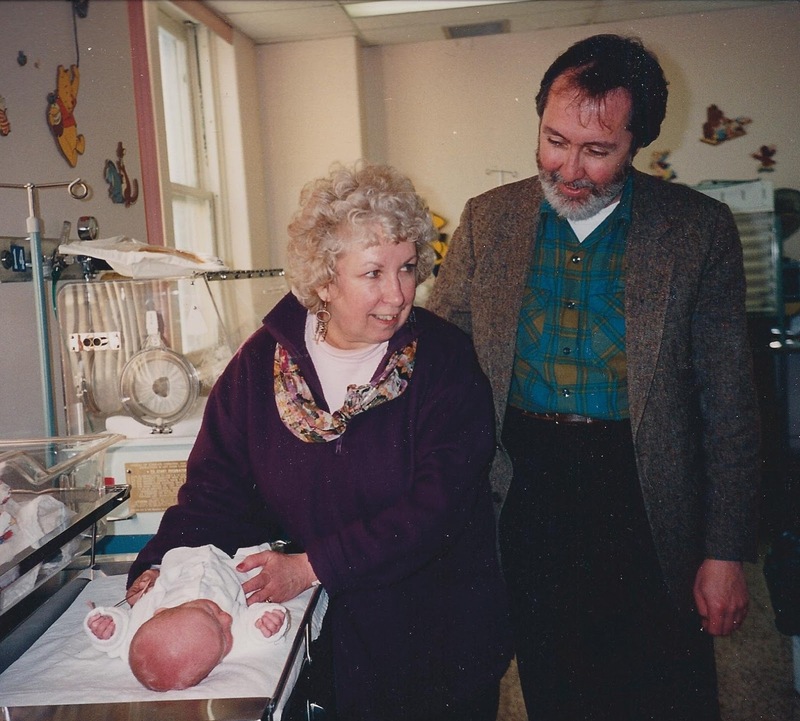 Our baby was born in the middle of the night, November 29, 1994. We got the telephone call just after 7 a.m. Dan was already downstairs and took the call; I sneaked quietly partway down the stairs so I could hear his end of the conversation. I'm not quite sure what I was thinking. I knew that we were committed to the baby – sight unseen, condition unknown. That was cause for a little apprehension. I knew we had respect for the mother and, although I didn't think she had changed her mind, anything was possible. I couldn't discern anything from Dan's end of the conversation: "yes", "no", "oh really." Until he hung up and I went down the stairs and he said, "It's a boy." I burst into tears, of course; I'm sure I would have burst into tears no matter what he had said. In Nova Scotia, adoptive parents are required by law to be accompanied by someone during the first 15 days of the baby's birth. The law was enacted to protect birth mothers from being coerced into giving up their babies during a very vulnerable period. We felt no resentment at the law and Lynn was very happy to be with us as we went to get our baby from the hospital. Just before one p.m. we step off the elevator onto the pre-natal floor. Donna, the baby's birth mother, and Jennifer, her three-year-old daughter, are in conversation with one of the nurses. "Hi Sharon," Donna says, softly but quite cheerfully. She acknowledges Dan, our friend Lynn, and Liz, our lawyer. We last met her when she was eight months pregnant; today, she is tiny, slim, and doesn't look like a woman who has so recently given birth. "Donna and Jennifer will go in first," the nurse says. "I'll come back and get you." I am nervous and shaky and don't know what to say to anyone. We all stand around reading the health posters on the walls. The nurse comes back in ten minutes and tells us we can go in. Donna is holding the baby, bending over so Jennifer can see him. "Look at the little hands," she says. "Isn't that sweet?" Jennifer is shy and not too interested; they're going directly from the hospital to see Santa Claus at the Mall. Donna looks at the baby affectionately and smiles. Then she passes him to me. "I'm giving him to you now, Sharon," she says. I am so moved I can't speak, but she understands. It seems like a ritual to me, a small ceremony she's planned to make it easier. It's something that reassures me during the waiting period, that she has made her decision carefully and is unlikely to change her mind. Within an hour, we are hurrying across a snowy runway to board the plane for the short flight back to Halifax. I'm carrying the baby. It is December 1, 1994. The baby is 58 hours old. I am just over 50. 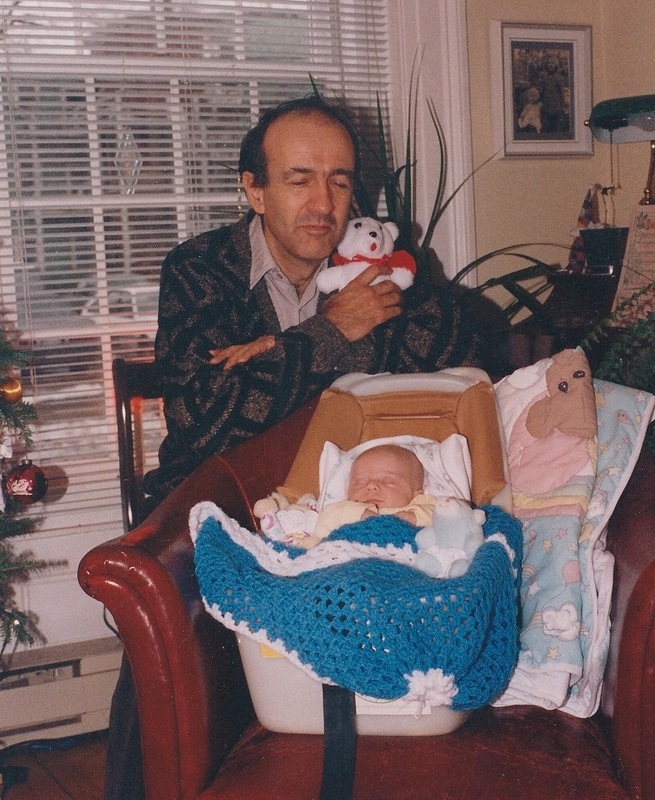 When we arrived back in Halifax, we took the baby directly to the foster home. For the next 15 days, Baby William Daniel (named after my father and his own new father) stayed in a small warm home with a young couple who had two children of their own and who – believe it or not – looked forward to having a newborn in the house again, if only for a few days. 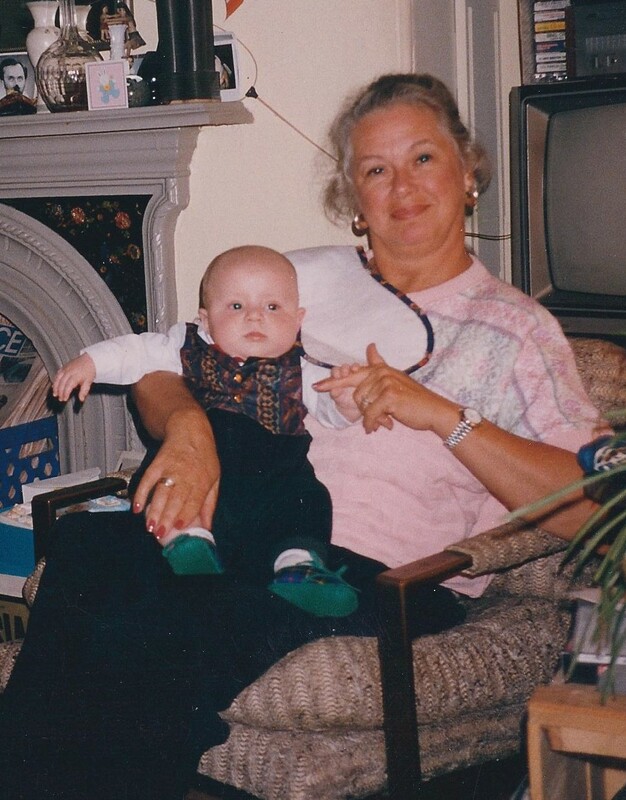 I visited William several times during the 15 days and finally, we decided it would be okay to buy some baby clothes, some feeding equipment, some bedding for the beautiful antique cradle that had been lent by a friend. 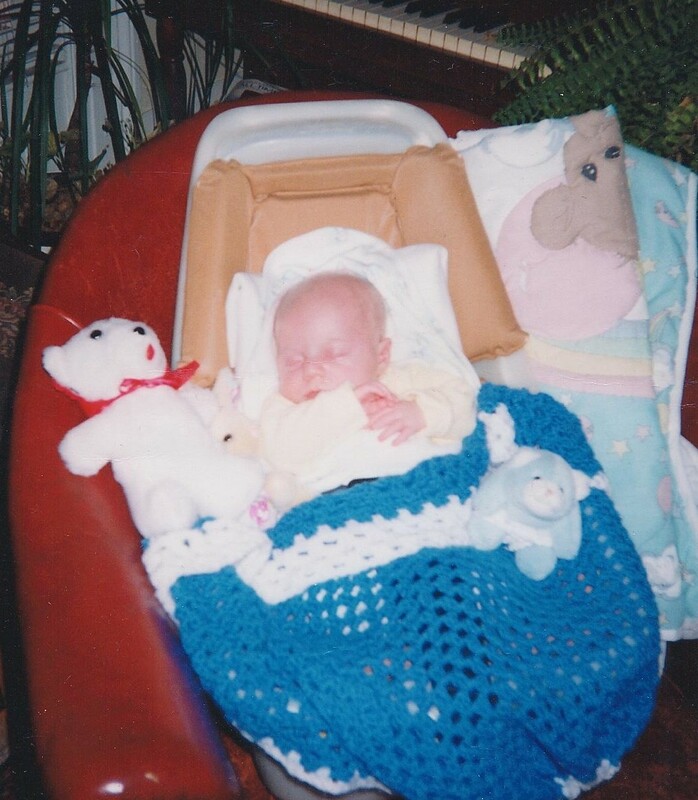 William's foster parents loved taking care of him and assured us that he was an easy and good-natured baby. At the same time, for us, they looked forward to the happy day when he would go home with us – as we all did. That day was December 16. The foster parents had everything ready for us to move him out; they had arranged a babysitter and planned a dinner out for themselves. We had the baby seat ready in the car. All day, into the evening, we waited for the phone call from the lawyer that would say everything was fine. Every half hour, we called the foster parents to say, "not just yet – but you go." It was after nine when our lawyer called: "Go get your baby!" she said. We only heard later that she and the birth mother's lawyer had been missing each other all day to sign the final papers and had finally caught each other at a Tim Horton's. The call to go get our baby came to us from a fast-food pay phone. And William's foster parents – in their going-out-to-dinner clothes – had waited for the call as well and were with us as William began the short journey to his new and permanent home. 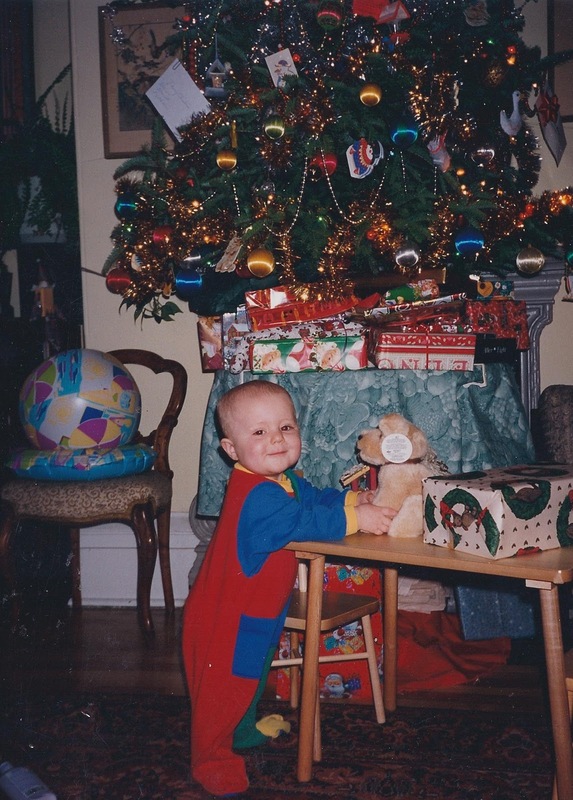 It was nine days before Christmas, 1994. All of this happened almost exactly two years ago. For William's first Christmas, we had a lot of relatives and friends come over to see our beautiful tree – and a new baby. We were happy that so many of them brought books, dozens of books, for such a tiny baby! That's John Holm, talking with Dan and Alexa. John got to hold the baby too. His foster parents were right. From the beginning, William was – and remains – a good sleeper, a good eater, a little fellow who seems to enjoy life. 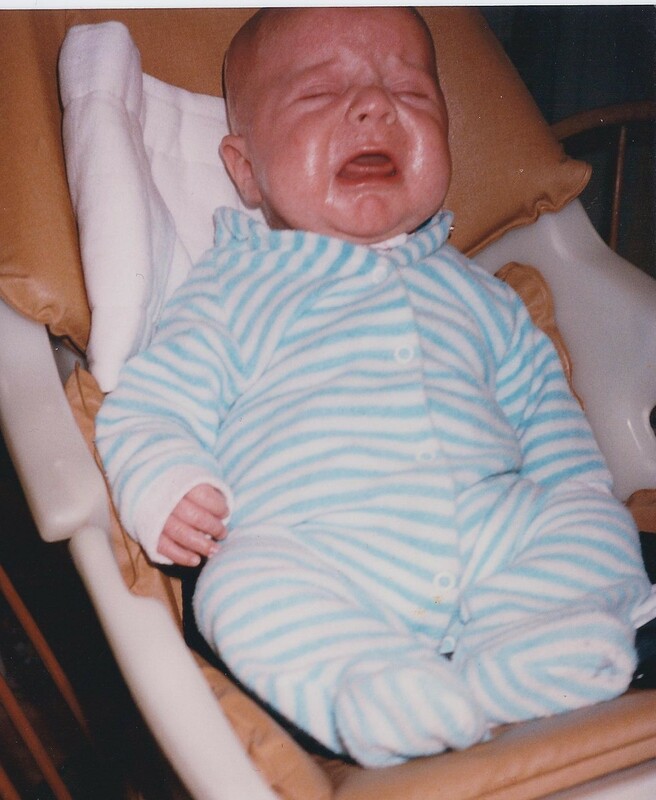 He cries only when he's hungry. 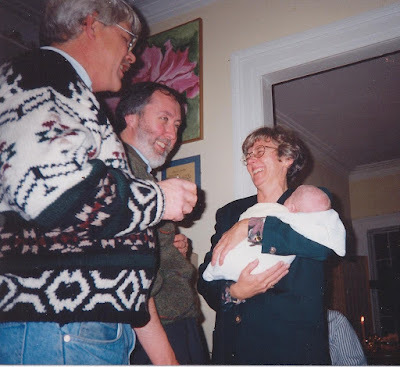 He was lovingly baptized on Easter Sunday, 1995, by Monsignor A.M. O'Driscoll, then-rector of St. Mary's Basilica in downtown Halifax, who had affectionately performed our marriage ceremony seven years before. Dan and I have never had any questions about whether we did the right thing. That just goes without saying. Our closest family – Dan's mother and brother, my sister, her husband and kids – all think this is a miracle for all of us. So many of our contemporaries, sending children off to university or awaiting grandchildren, envy us this wonderful adventure – not because they're unhappy with how their children turned out; just because they think they'd do it differently now. I too think that there are as many advantages as disadvantages in being mature parents. If we lack something in stamina, perhaps we have gained something in knowing what's really important in life. If we hate the music young people listen to, maybe we've been around long enough to know that good music (by all parents' definition, the music that we listened to) will come back. We don't feel that life is passing us by; we have friends who range from their 20s to their 80s and we know that William has something to gain from knowing all of them. But there are still questions. For example, how do I feel when people ask (and they do!) if I'm William's grandmother? More to the point, how will William feel when they ask him if I'm his grandmother? (And they will.) And did Dan and I jump the queue? Is private adoption fair? Is international adoption positive – not only for children and families, but for societies and communities? We continue to look for answers. But for now, we're looking forward to Christmas. Dan and I – even before William joined us – have always been Christmas people. We love to decorate, to cook, to entertain, to listen to the music, to go to Church. Last year, for the first time, we put our Christmas tree on a table to protect it from a completely unreasonable 13-month-old. This year, I think we'll have a big tree again – bearing in mind that we still have those three cats and have always tied the tree to the wall with fishing line anyway. We'll try to explain the birth of Baby Jesus and what that has to do with Santa Claus bringing toys. We'll teach Away in a Manger while knowing that we can't avoid those reindeer and wondering if he'll confuse them with the animals in the stable where Jesus was born. Mostly, we'll be happy to see our own families' Christmas traditions carried on – the old stories, the old ornaments, the old recipes. And the most important – we'll teach that we should try to be together and enjoy it together and love one another. Oh my, I remember that day in the hospital often, and it brings me to tears each time. I especially think of Donna and Jennifer. I don't think I ever knew their names but I remember Donna being so young and I never doubted that she was comfortable with her decision and there was no second guessing for her. I remember the flight home and the trip to the foster parent's house, and of course, I remember tiny newborn William and you and Dan. I don't think I ever thanked you for letting me play a small part in your new adventure, but I thank you now. It was a life changing experience for me. Thank you for sharing such personal life events with us Sharon and Dan. I knew you had adopted, but never knew any details. Touched my heart.